FA Cup winner qualifies for the UEFA Europa League. In the event of a points tie the following will apply: 1. Points without rounding. 2. Head-to-head points. 3. Head-to-head goal difference. 4. Head-to-head goals scored. 5. Goal difference. 6. Goals scored. After 26 games the teams are separated into two groups of six and eight teams (Championship Group and Relegation Group) and will play ten, respectively seven more games and the points will be added on the first 26 games. * Note that table splits in half after 26 games of season - no team from top play-off can drop into bottom one, and no bottom play-off team can climb into top one, irrespective of points earned. Get all of FC Astra Giurgiu latest football results for every football game they have played. 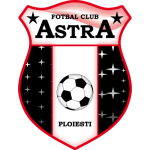 See how FC Astra Giurgiu has gotten on in the 2018/2019 league tables, cup competitions and friendly games including the Liga I football tournaments. Get every football score, football fixture and football stats for FC Astra Giurgiu in the 2018-2019 football season only at ScoresPro - the #1 Football livescore website for FC Astra Giurgiu! Get the latest FC Astra Giurgiu football scores and all of the FC Astra Giurgiu stats for all Liga I games in the 2018-2019 season only at ScoresPro, the #1 football & soccer livescore website for FC Astra Giurgiu football!